Somewhere in the back of my head, I hear this little voice (not that I normally hear voices mind you) that says, "That's it! I'm sick of feeling responsible all the time." Of course, I tell it, "Quiet in back or I toss you out of the bus." It is true that I throw a lot on my plate and, for some reason, when I take on a project it dedicates sections of my life from then on to it. The best examples of that are the newsletter, website, podcast and writing the book. I think that is why I surround myself with some reminders that I really am a child at heart. There's a whole section of my DVD collection dedicated to that but while cruising through the store looking for gifts for the nieces and nephew, I saw Ernie. Yes, I know there have been rumors that Ernie and Bert are ummm... gay. I don't see it but what I remember most about the character are his rubber ducky and his laugh. I catch myself mimicking it still to this day. So, I quickly threw Ernie in the cart under the guise that I'm getting it "for someone." Anyhow, he now sits up on my very crowded headboard with his new friend Mr. Raider Bulldog. 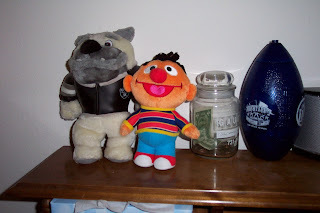 Even though there are times when I look over there and think that Ernie looks like Mr. R.B. 's prison cell-buddy (for lack of a better word), I also see something that quiets that little voice and says, "I haven't forgotten what it's like to be a child. I'm just too responsible to let it control my life." Heck, I'd love to wake up as early as possible on Saturdays to watch cartoons in the morning with my Just Right, Kix or Pac-Man cereal sitting in front of me. But as you notice from that train of thought... cartoons now are on Sunday mornings (and there are several 24/7 channels dedicated to them) and it is really hard to find any of those 3 cereals. When things change, you have to grow up and accept it... but hold that little something to remind you of those early Saturday mornings. No, I'm not calling my mother names. Mom suffered a neck injury while at work nearly a decade ago. This changed her life as she has had multiple surgeries to alleviate migraine headaches and more recently shooting pains and numbness in her left arm. Well, it seems that after all this time that they have figured out that that the bit of bone (they took from her hip) that they used to fuse 2 of her neck vertebrae (which was reinforced with a metal plate) broke loose and has been pinching her spinal cord. According to the two doctors she has been going to recently (as well as her insurance) a surgery is required to pull that bone out. The photo you see above was taken of my parents in the early 70's. I was recently told by my mother that it actually was some photo manipulation as they had people between them in the photo. Mom likes the photo quite a bit so I decided to snap a quick shot of it from on top of our piano. Anyhow, this morning she went into surgery to have that bone removed. I called and talked to her last night while I was at lunch. I'm optimistic and I'm hoping that Mom remains the fighting spirit that she has always been. There is a strong chance (50%) of paralysis in this surgery but then again she was also told that she would progress towards that if the bone weren't removed. Essentially, having the bone pressing against it for so long is going to require so much longer for it to regain its shape. After typing the first two paragraphs, I decided to call around a little. Since I get off work around 1am and she was due to head to the hospital at 7:30am, I opted to go to sleep as I have to work today and woke up just before typing this. After calling my sister, I tried the hospital (as grandma doesn't have a cell phone that I know of) and was having a nurse check on her status. Then my cell phone started ringing. I looked down and it said "Mom." Those were the last words I expected on the Caller-ID and the first out of my mouth as I answered. There was a long pause but it turned out that grandma got ahold of Mom's cell. According to her, the doctor said the surgery went better and quicker than expected. I'll be heading over there after the podcast tomorrow. Keep your fingers crossed. As for specific personality traits, you are adventurious (100%), romantic (86%), intellectual (73%), horny (72%). Your political views would best be described as Libertarian, whom you agree with around 79% of the time. Your attitude toward life best associates you with Middle Class. You make more than 0% of those who have taken this test, and 28% more than the U.S. average. By the way, your hottness rank is 64%, hotter than 90% of other test takers. Ok, now that I'm feeling a bit more like myself, I have projects to get started on. I even made a little list last night. 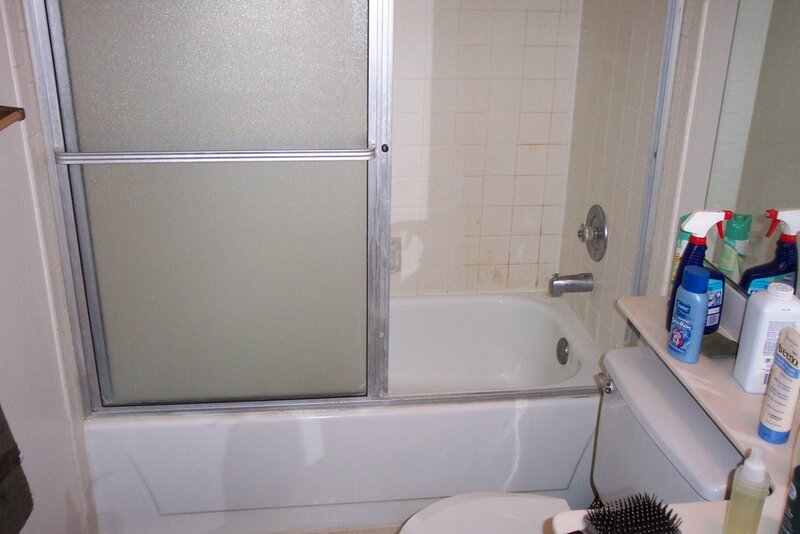 One of the big ones will be taking out the shower/bathtub in the hopes of converting the area to a full shower. It should be easier than when I converted the landscape outside, right? Before moving in, a co-worker gave me a bunch of boxes containing glass block. 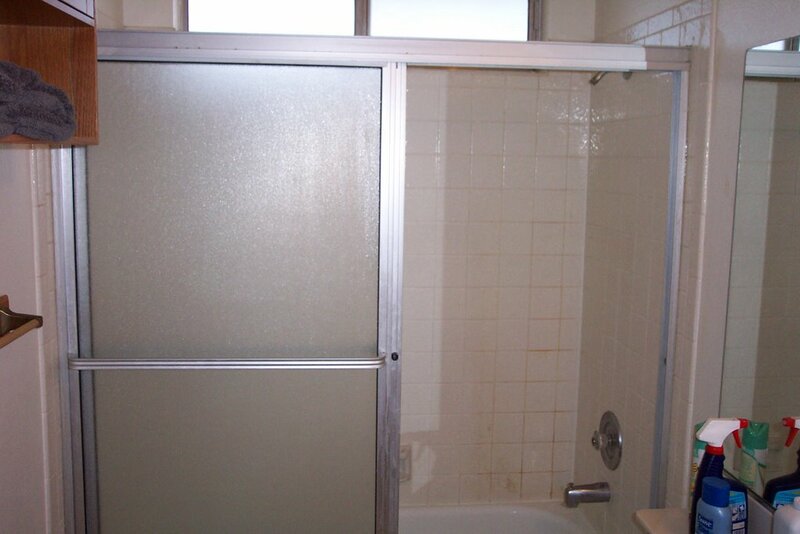 I expect to integrate that into the shower wall facing this way. I may also be replacing that window above the shower as it is useless (the contractor building the home put those in to avoid placing air vents in the bathrooms.) This means that I'll have to add ventilation to the remodel. But it should be a good project. I'd like to do the tiling myself and subcontract out the plumbing (I'm not even going to attempt it.) But first thing will be removing and cleaning the area. It'd probably be easier for me to screw it up and just call DIY To The Rescue. I really watch too many of those shows.